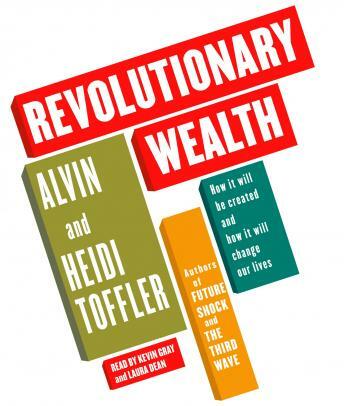 Starting with the publication of their seminal bestseller, Future Shock, Alvin and Heidi Toffler have given millions of readers new ways to think about personal life in today’s high-speed world with its constantly changing, seemingly random impacts on our businesses, governments, families and daily lives. Now, writing with the same rare grasp and clarity that made their earlier books classics, the Tofflers turn their attention to the revolution in wealth now sweeping the planet. And once again, they provide a penetrating, coherent way to make sense of the seemingly senseless.Revolutionary Wealth is about how tomorrow’s wealth will be created, and who will get it and how. But twenty-first-century wealth, according to the Tofflers, is not just about money, and cannot be understood in terms of industrial-age economics. Thus they write here about everything from education and child rearing to Hollywood and China, from everyday truth and misconceptions to what they call our “third job”—the unnoticed work we do without pay for some of the biggest corporations in our country. They show the hidden connections between extreme sports, chocolate chip cookies, Linux software and the “surplus complexity” in our lives as society wobbles back and forth between depressing decadence and a hopeful post-decadence. In their earlier work, the Tofflers coined the word “prosumer” for people who consume what they themselves produce. In Revolutionary Wealth they expand the concept to reveal how many of our activities—whether parenting or volunteering, blogging, painting our house, improving our diet, organizing a neighborhood council or even “mashing” music—pump “free lunch” from the “hidden” non-money economy into the money economy that economists track. Prosuming, they forecast, is about to explode and compel radical changes in the way we measure, make and manipulate wealth. Blazing with fresh ideas, Revolutionary Wealth provides readers with powerful new tools for thinking about—and preparing for—their future. This book is a lengthy collection of facts and factoids without a strong unifying theme. What's it about? Pretty much things we already know: the economy is becoming more knowledge-based, technology is changing everyone's lives, and so on. But this simple message is presented in an almost frantic, breathless manner. Ultimately there's not much insight here. Or, if there is, it's buried somewhere in all the factoids.